Classical economists thought that a thrift campaign would enrich households. John Maynard Keynes argued that a rise in thrift would, paradoxically, impoverish households because of a fall in aggregate demand. 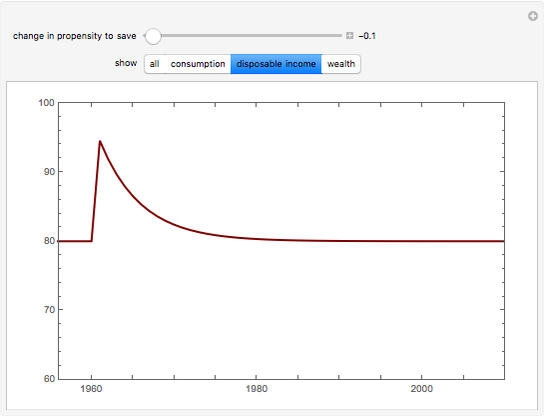 This Demonstration shows the effect of a one-time, permanent change in households' propensity to save out of income for Godley and Lavoie's (2007) simplest stock-flow consistent model ("MODEL SIM", for simplest). 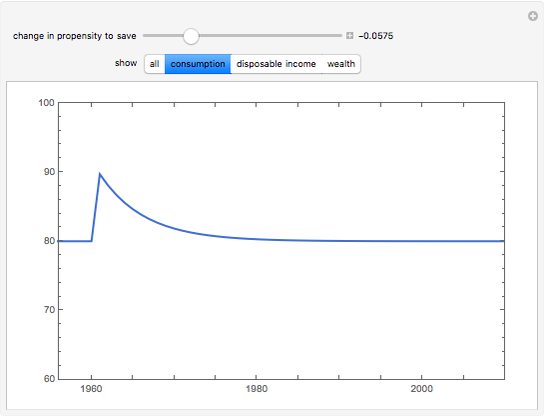 We see that a rise in the savings propensity decreases consumption and disposable income temporarily, but as wealth accumulates, consumption and income return to their steady-state values. For this model, therefore, there is a "paradox of thrift" in the short run, but not the long run. 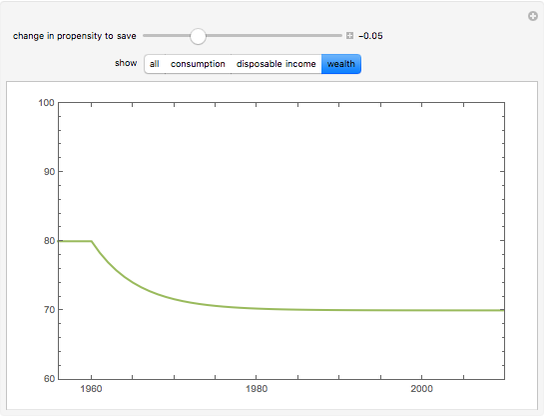 The years on the axis, the period in which the savings propensity changes ("1960"), as well as the initial values of consumption, disposable income, and wealth ("80") correspond to Figure 3.8 of Godley and Lavoie (2007), but are otherwise arbitrary. For a detailed description of the model implemented here, see W. Godley and M. Lavoie, Monetary Economics: An Integrated Approach to Credit, Money, Income, Production, and Wealth, P ., Basingstoke, U.K.: Palgrave Macmillan, 2007. Credit is due to Gennaro Zezza's implementation, MODEL SIM for Eviews version 6. Kevin W. Capehart "The Paradox of Thrift in a Simple Stock-Flow Consistent Model"